Grouping of nine books on hunting Canada and Alaska, Atcheson, Kodiak, Young, APHA, from famous hunter's library - Sportsman's Legacy, Fine firearms, related books and sporting collectibles. Representing estates, collectors and nonprofit conservation organizations. 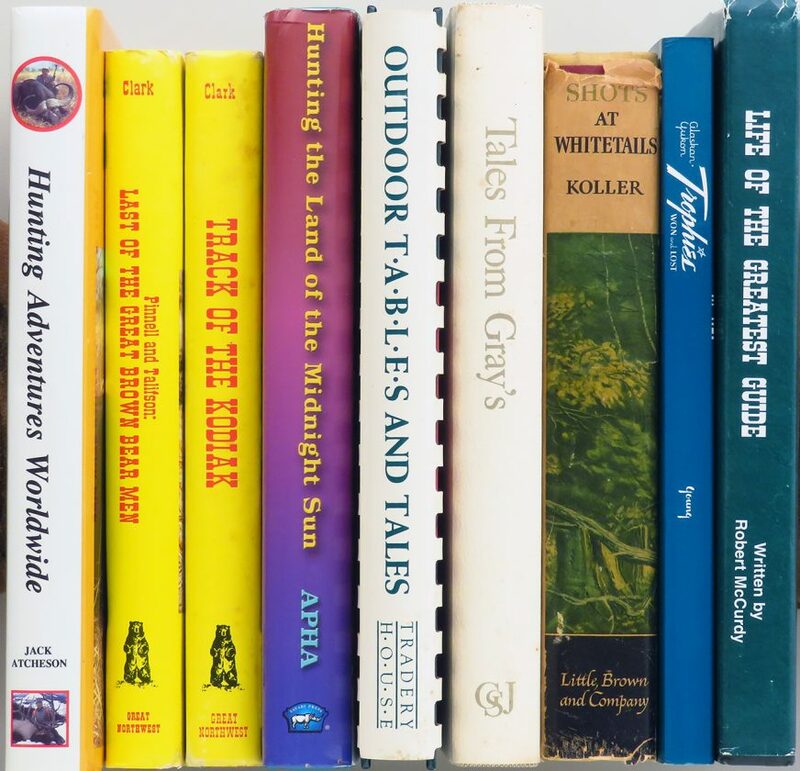 Grouping of nine hunting books, most related to Canada and Alaska. Many are from the library of the late Henry Budney, a successful businessman who was supremely dedicated to hunting Alaska and who was fortunate to take one of the largest moose ever recorded. He has written his name in many of this group. Hunting Adventures Worldwide by Jack Atcheson, 1995 Stoneydale Press, inscribed to Henry Budney; Pinnell and Talifson, Last of the Great Brown Bear Men by Marvin Clark Jr., 1974, Great Northwest Publishing, excellent; Track of the Kodiak by Marvin Clark, Jr., stated first 1984, Great Northwest Publishing, excellent with good DJ; Hunting the Land of the Midnight Sun by members of the Alaska Professional Hunters Association, stated second, 2003, with gift inscription from Alaska guide Fred Sorensen, who guided Budney to his spectacular moose, excellent; Outdoor Tables & Tales by Robert Neill, 1992, Southeastern Outdoor Press, excellent; Tales From Gray’s by Ed Gray, 1986, GSJ Press, excellent; Shots At Whitetails by Lawrence Kolar, stated first, 1948, Little, Brown and Company, very good with poor DJ, Budney bookplate; Alaskan-Yukon Trophies Won and Lost by G.O. Young, paperback, very good; Life of the Greatest Guide by Robert McCurdy, gift inscription to Budney, excellent with good DJ. The price is firm. $250 plus shipping.